Step aside, Nova Scotia, and take a seat British Colombia; Niagara is perpetually voted Canada’s most stunning area, and the town of Niagara-on-the-Lake is nestled comfortably as the number-one most beautiful city in the country. The quaint shops and cozy parks are cute and welcoming, and there is plenty to do and see even on a day trip from Niagara Falls. However, for a limited time, Niagara-on-the-Lake is dressed up in its winter whites and looks even more gorgeous than usual. Here are all the must-see places and attractions that can’t wait for warmer weather. The city prides itself on its profound emphasis on the arts — especially the theater. In tribute to noted playwright Bernard Shaw, the town hosts a yearly festival, called the Shaw Festival, featuring the world’s best plays, including comedies, dramas, musicals, and everything in between. The magic of the stage can bring audiences to laughter or tears, and Niagara-on-the-Lake works to provide world-class productions at its theaters throughout the year. The Shaw Festival is on hiatus during the winter months, but the theaters that proudly present its plays continue to offer shows while the snow falls. There is nothing more pleasant than snuggling up to a fantastic show while winter chills the air outside. Burrowed into the countryside, Niagara-on-the-Lake is settled between a handful of the absolute best vineyards and winemakers in the country. Year-round, these masters of wine offer tastings of their best vintages as well as pairings with world-class meals in their cafes and restaurants. 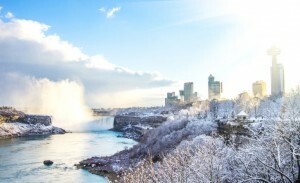 While winter certainly isn’t a growing season, it is the crucial period that creates Niagara’s signature ice wine, a sweet and unique Canadian variation on Riesling. During the off-season, you’ll be given the star treatment as the best wineries welcome you to warm your bodies and spirits with amazing drinks and food. Niagara-on-the-Lake looks and feels like a city frozen in time, but the feeling is even more powerful when you’re riding an old-fashioned horse and carriage through the city’s streets and parks. 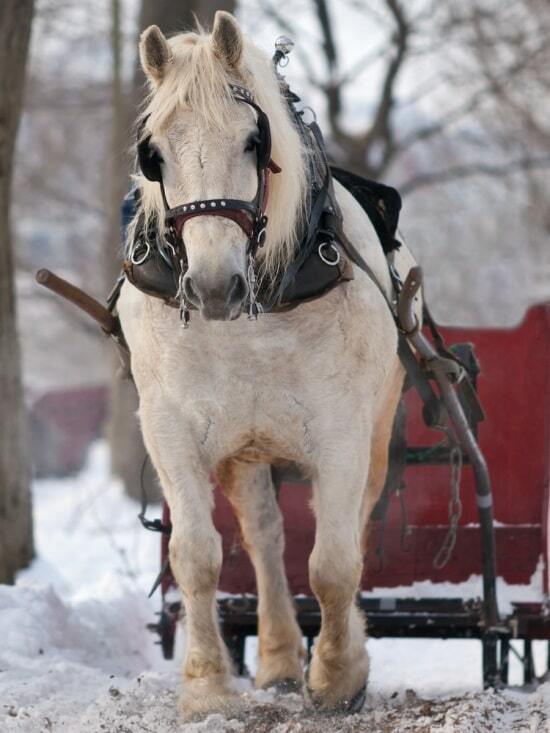 The carriage driver can give you a full tour of the city or simply convey you from one place to another. It’s a unique and comfortable thrill, especially for couples. In wintertime, the experience is even more intimate. The quiet chill lends itself to snuggling for warmth in the back of the carriage. The town’s twinkling lights and holiday music make the simple ride feel like a journey through wonderland. Because the town is one of the best preserved examples of life in the 19th century, it boasts a handful of opportunities to learn about the history of Niagara and the experiences of its people during that time. The Niagara Historical Society Museum is filled with artifacts and information on Niagara-on-the-Lake and the surrounding region throughout its 9,000-year history. Throughout this winter, the museum is focusing its exhibits on the experiences of local Canadians during the great wars. After exploring the museum, you can warm up in the province’s oldest working inn, Olde Angel Inn, whose regulars can regale you with stories you’re not likely to find in history books. Niagara-on-the-Lake is a gem of the Niagara region, but during winter, that gem gleams brighter than usual. Instead of waiting for the crowded and busy tourist season, see how the magic of winter transforms Canada’s prettiest town into a real-life winter wonderland.